Download Free jQuery Accordion Menu, Accordion Slider, and other Accordion-style plugins at our jQuery Accordion Section. Page 7 . Wiper is a cool and fancy jQuery slider plugin that rotates and collapses the slides with amazing accordion-like CSS3 transitions and transforms. Accordion is a lightweight, flexible and customizable jQuery plugin that allows to expand and collapse html content in a cool accordion interface. Collapsable List is a simple jQuery plugin which turns standard html unordered lists into a searchable and collapsable list with smooth accordion animations. Month Selector is a plugin for jQuery and jQuery UI that takes advantage of jQuery Item Selector to create an accordion style month and year selector on your website. 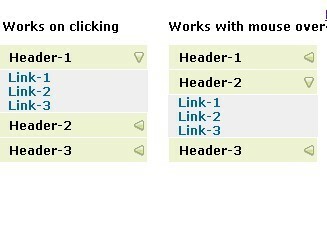 Item Selector is a small plugin for jQuery and jQuery UI that allows you to select items in an accordion style widget. Specially designed for mobile devices. stripe is an awesome and smart jQuery plugin for creating a cool striped image gallery with smooth transition animations similar to an accordion content slider. 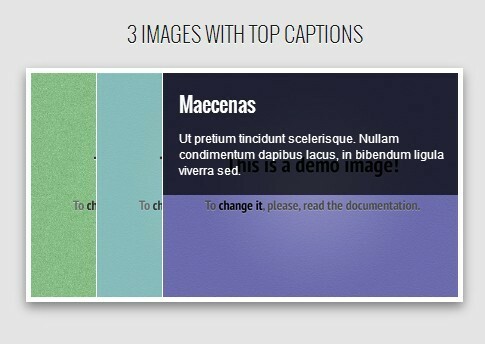 A simple and easy-to-use jQuery plugin that allows you to expand or collapse a content panel with smooth sliding effect when clicked the header of the container. jquerySimpleFAQ is a simple and easy-to-setup jQuery plugin that allows you to create Frequently Asked Questions and Answers interface on your website. mSlide is a simple and touch enabled jQuery plugin for easily creating an horizontal accordion Slider which supports any html elements (div, image, etc...). conventAccordion is a fast and beautiful jQuery plugin that allows you to create responsive horizontal and vertical accordion slider with cool Elastic Collision Effects on your page. awsAccordion is a jquery based accordion generator that allows you to easily and quickly create responsive vertical horizontal accordion effects for your websites or applications. Collapse is a simple, lightweight and flexible jQuery Plugin that allows you to expand or collapse content to save space and reduce the load time. Form Accordion is a jQuery Plugin for easily hiding and revealing related form fields conditionally. raccordion is a jQuery Responsive Horizontal Accordion Image Slider that can adjust according to the size of the browser width.